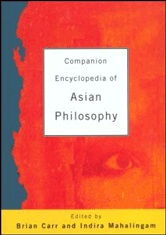 Covers the main traditions within Asian thought: Persian; Indian; Buddhist; Chinese; Japanese; and Islamic philosophy. Each section provides comprehensive coverage of the origins of the tradition, its approaches to, for example, logic and languages, and to questions of morals and society. Also contains useful histories of the lives of the key influential thinkers, as well as a thorough analysis of the current trends.